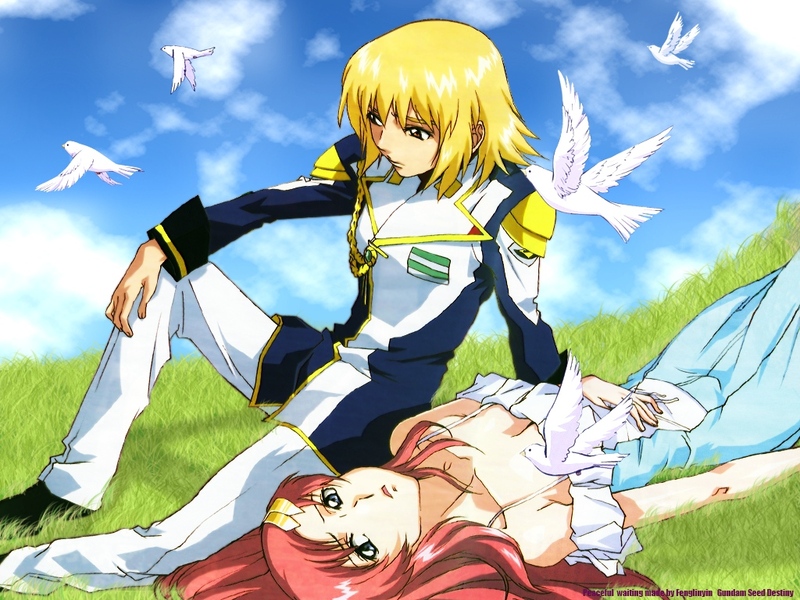 Oh this is just so pretty..oh i love this scan and the background goes so good with it..oh and the clouds are very pretty in there..oh this is very pretty..its just makes me so happy to see this scan with cagalli and lacus so happy with each other and this peaceful background...oh this is very pretty. Seems like you did well. I love the atmosphere at the back... sort of lightens up their serious thinking mood. I have been waiting for someone to use this pictures! Looks great! I can't say the scan you used matches the wallpaper. Why? Their expression is rather dull and sad so a darker background would be most fitting for it. And the birds don't really go with it. They do symbolize peace but the characters don't look like they're at peace. It's a nice wallpaper... Good work! yao! i recognized those tsubasa birds! lol! anyway, I love the scan of the two! All two of them look hot. Hellooo..Unmm.....This wallpaper so beautiful. Cagalli and Lacus are so cool and background look good. Great work- Thanks for sharing.